Therapy Chicago: When Is It Time for a Mental Health Check-Up? 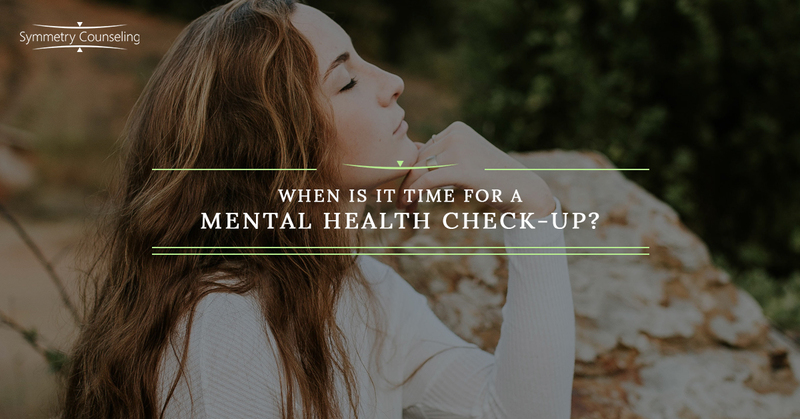 When Is It Time for a Mental Health Check-Up? We go to our primary care doctors when we are not feeling well or annual for a physical check-up. We go to the dentist 1-2 times per year for check-ups or when we are having a tooth ache. We get pedicures and manicures, massages, haircuts, etc. all to make ourselves feel good. But what is another important thing that controls our body that we tend to neglect? OUR MIND! We often forget that when we are not feeling well, it may be due to stress. Are you grinding your teeth at night due to stress? Maybe it’s time for a mental health check-up to see if you are doing well mentally. There is no harm in getting a check-up every few months. Grouchiness. Are you feeling not like yourself and you are seeing yourself becoming more irritable lately and unable to control your emotions? Do you feel like your mood is fluctuating more than normal and you are getting angry at friends and family for smaller things? Sleepiness. Do you feel like you are not getting restful peaceful sleep? Do you feel like there are days when you just do not want to get out of bed? Are you having a hard time falling asleep, staying asleep, or waking up? Are you getting less sleep than you would like? Not wanting to be around people. Have friends invited you out or to their place and you just do not want to go? Even if you are out, you just want to go home and isolate? Do you feel like you are not interacting with friends/family in person, via the phone, or on social media? Appetite changes. Are you eating more than you normally do? Are you eating less than you normally do? Do you sense that you are not eating healthy foods or going for whatever you can find? Unable to relax. Do you see yourself constantly on the go and not being able to just sit and relax for a few minutes? Do you feel like you are often just wanting to fix everything that is in front of you? If you answered any of those questions with “yes” and can associate with any of those questions, then it might be time to come in and speak to one of talented therapists. It is okay to get the help that you need. Myth #1: “I can do it alone”. Yes, you can do it alone, but it is also important to speak to a trained therapist to help identify if there are other underlying concerns that you might not be able to identify. Just like if you have a stomach ache for multiple days, you will most likely go see a doctor to see what is the bigger concern — same with your mind! Myth #2: “If I got to therapy, I’m weak.” Seeking professional help is not a sign of weakness. It is a sign of strength. You are able to recognize that you need help and you cannot do it alone. Myth #3: “Only ‘crazy’ people go to see therapists.” That is completely wrong. People come in for therapy for all reasons. You do not also necessarily have to have anything “wrong” with you. Therapists are also not going to “fix” you, but yet help you process and utilize coping skills to better you. Myth #4: “It’s too expensive.” All medical bills are expensive, but your insurance might cover your mental health sessions. Also, if you are employed, there are employee assistance programs will cover a few sessions. In many cities there are also free or very low-cost therapists. If you do not ask your employer, insurance company, or seek out services, then you will never know. Always ask! Reach out to any of our skilled therapists if it’s time for your mental health check up!